We're just months away from the 2017 Annecy Animation Festival, one of the most important events in the animation calendar. There's still a way to go until the festival reveals the feature film line-up and the full list of events. In the meantime, the organisers have this week unveiled the line-up of TV and Commissioned Films. This year 31 TV Series and Specials and 40 commissioned films are screening in competition. In the TV category a number of familiar shows will be screening, including episodes from Bojack Horseman, Puffin Rock, Trollhunters, The Loud House and Clarence. In keeping with the festival's international nature, these higher-profile shows will be rubbing shoulders with animation from France, Mexico Russia, Poland, and more. Noticeably absent from the selection is anything from Japan- which is a little strange considering it's most likely the biggest producer of TV animation in the world today. The commissioned films are a selection of commercials, music videos, idents and promo films and featuring entries from the US, UK, France, China, Israel, Egypt and more. 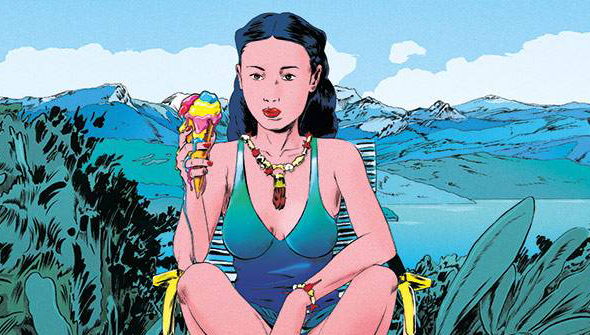 This year's festival will take place June 12-17 in Annecy, France. Bojack Horseman "Fish Out Of Water"
Clarence "The Tails of Mardrynia"
Ernest and Célestine, The Collection "Blizzard"
Fantasy Patrol "Everybody Dance Now"
INUI "She Puts the Ice in Nice!" La Cabane à histoires "Rosa Lune et les Loups"
Lily's Driftwood Bay "Mr Parrot"
Puffin Rock "The First Snow"
Rolling With The Ronks! "A Good Connection"
Simon "Je ne veux pas aller à la piscine"
Super Science Freinds "The Phantom Premise"
The Loud House "No Guts, No Glori"
The Tiniest Man In The World " The Sweater"
Adult Swim ID "Mr Pickles"
Fleddy Melculy "Apu Van De NightShop"
Giedré "King Of The Animals"
Hadag Nahash & Infected Mushroom "Legal Eyes"
Holland Animation Film Festival 2017 "Festival Leader"
Le Mot des académiciens "Verre"
TED-Ed "How Small are we in the Scale Of The Universe?" The School Of Life "Cultural Mining"
For more information on any of these and the festival itself, visit the Festival's website.